Long gone are the days when “Vegetarian” meant a bowl of wilted salad leaves or overcooked vegetables! 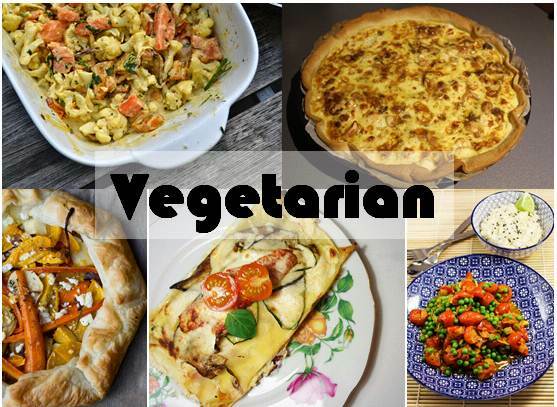 There are now even restaurants in Belgium dedicated to serving tasty, filling and nutrious vegetarian meals (i.e AMI and Dolma) or at least have a wide variety of vegetarian offerings (i.e. SOUL). Some would argue that the benefits of cutting out meat (even temporarily) can really make a real difference – lower blood pressure, weight loss, lower cholestrol, better moods and an overall improvement in general health. I have to confess to loving a steak every once in a while… so am not sure that I am ready for a full “both feet” vegetarian eating plan, but watching our community of bloggers posts has really highlighted the amazing vegetarian recipes that are out there… so whether you are 100% vegetarian or just want to get in a good portion of your 5 a day – these are the Top 5 that I have drooled over in the last month! Aude from Brussels Foodie shares a recipe for Endive, Feta & cashew Pie… guaranteed to be the highlight of any vegetable inspired meal! While Annelies of Liezie Peasy shows us how to make a delicious Tomato & Pea Curry! Still on the spice route – we loved Greet of Fleur Fatales Spicy Cauliflower, pumpkin & sweet potato curry! And last – but definitely NOT least – this gorgeous vegetable Galette from Iris of SWonderful reminds us that simple is better! Do you have a favourite vegetarian recipe to share with us? Just add the link to the comments section below!